This is probably the most widely known and loved of all Cape dishes. It has its origins at the Cape in the 17th century when the Dutch Settlers, brought their unique style of cooking, infused with the spices of the East, to the Cape. But it is a Cape dish and some feel not part of the Boerekos heritage of the interior. 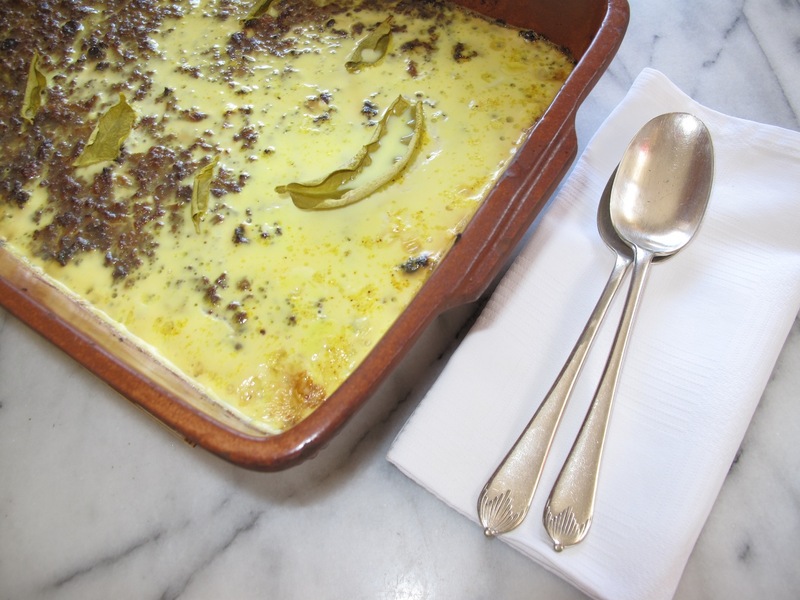 There is a gentle controversy about Bobotie as the older Cape food writers like Louis Leipoldt suggest that this was a dish from the East brought here by slaves from Java during the early days of the Dutch settlement. Dr Hettie Claassens in her history of food at the Cape [Die Geskiedenis van Boerekos] claims that this is originally a dish from the Middle East, brought here by the Dutch who were already cooking with spices obtained from the East before the early settlement in the Cape in 1652. In earlier times, it was made as a Monday supper dish from left-over roast lamb or beef usually the remains of a Sunday roast, but in the South African home of today raw ground beef is usually used. After many years of fiddling, looking at what others did to the recipe, and testing myself, this is my version. Bobotie is traditionally served in an earthenware casserole with yellow raisin rice, toasted coconut, sliced banana and chutney. Method: Soak the slices of bread in the cold milk and when saturated, squeeze dry in a sieve, set aside. Reserve the milk to make the custard topping. Preset the oven at 180°C. In a heavy saucepan, heat the oil and the butter, start browning the onions over medium heat. After a while add the garlic and continue cooking slowly until the mixture is a light golden brown. Add the curry powder, turmeric and white wine vinegar, tamarind or lemon juice and cook for a few minutes to release the aromatic oils of the spices. Add the ground meat and stir with a spoon to break it up, keep stirring until it loses its red colour. Add the chutney, almonds, sultanas, grated rinds, natural or palm sugar, bay leaves and seasoning. Add one of the eggs, beaten, the soaked bread and the ground almonds. Taste and reseason if necessary. This is your opportunity to add more curry powder or garam masala to adjust the heat to your taste. Pack into a flat ovenproof dish and smooth off the top. Cover with a sheet of foil and bake in the preset oven for one and a half hours. Turn down the oven temperature to 150°C to cook the topping. To make the topping, whisk the remaining egg into the milk season and strain if required. At this point you could add a knifepoint of turmeric to the milk just to give the topping a yellow colour. When the Bobotie comes out of the oven, pour over the custard. Garnish in a pattern with the lemon or bay leaves and return to the oven for a further half hour or until the topping has set. I have eaten Bobotie which had bananas cut in half lengthwise used instead of the leaves, I found this delicious if not traditional. Serve with yellow turmeric rice with raisins, [known as Begrafnisrys or Funeral Rice], a fruity chutney, sliced ripe bananas, a tomato onion and fresh coriander sambal and toasted coconut.